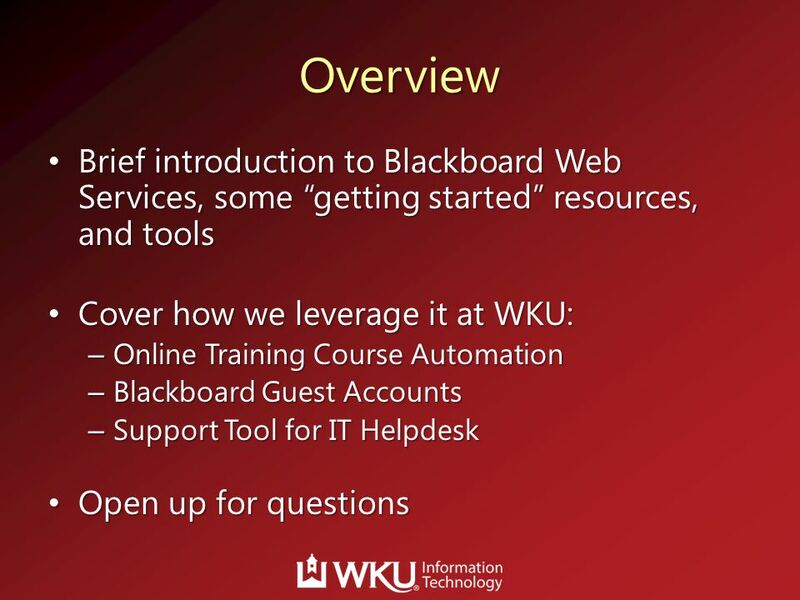 3 Overview Brief introduction to Blackboard Web Services, some “getting started” resources, and tools Cover how we leverage it at WKU: Online Training Course Automation Blackboard Guest Accounts Support Tool for IT Helpdesk Open up for questions So, I thought I would start off by giving a brief overview of what Blackboard Web Services are (for those of you who may not be familiar). 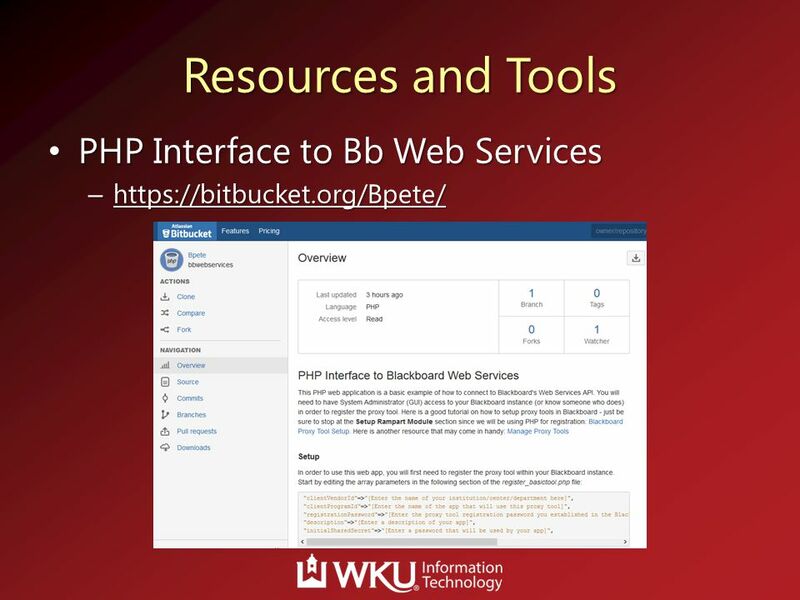 I'm not going to go into detail on code examples or setting up proxy tools, but I will give you some resources I used to get started. 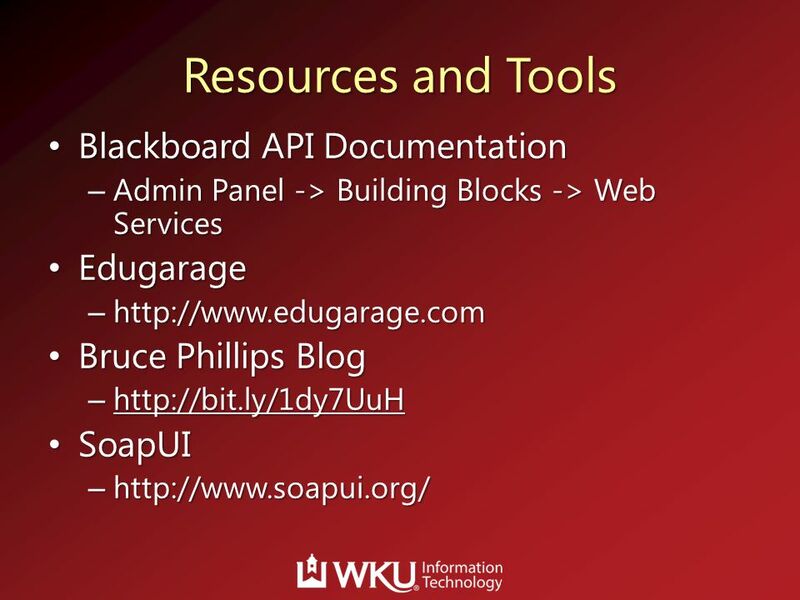 Unfortunately there is not a whole lot of GOOD documentation out there. 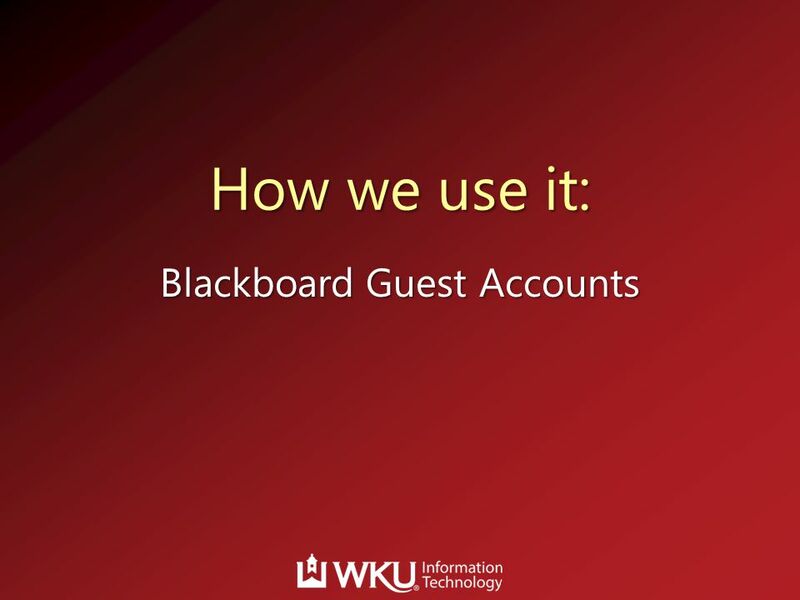 And then I will show you guys how we've been able to leverage it here at WKU. 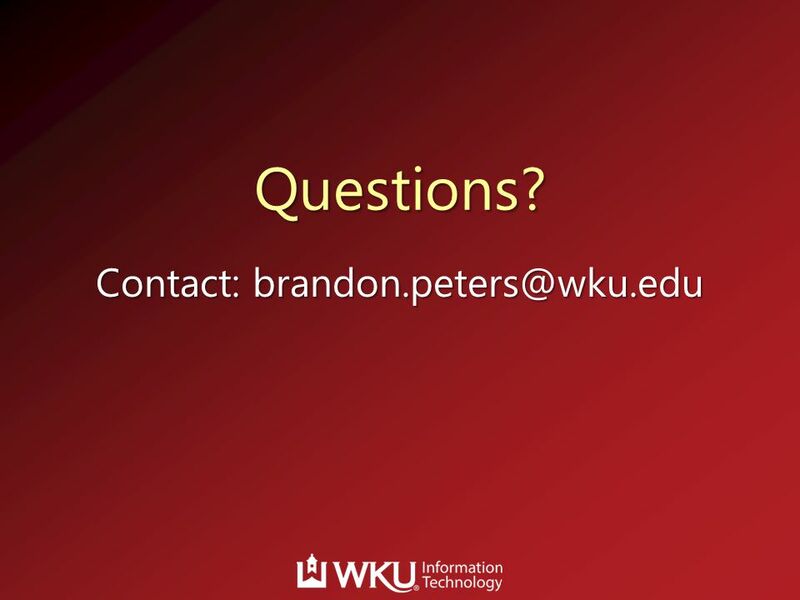 And then at the end of the presentation, I'll open it up for questions. That sound good? 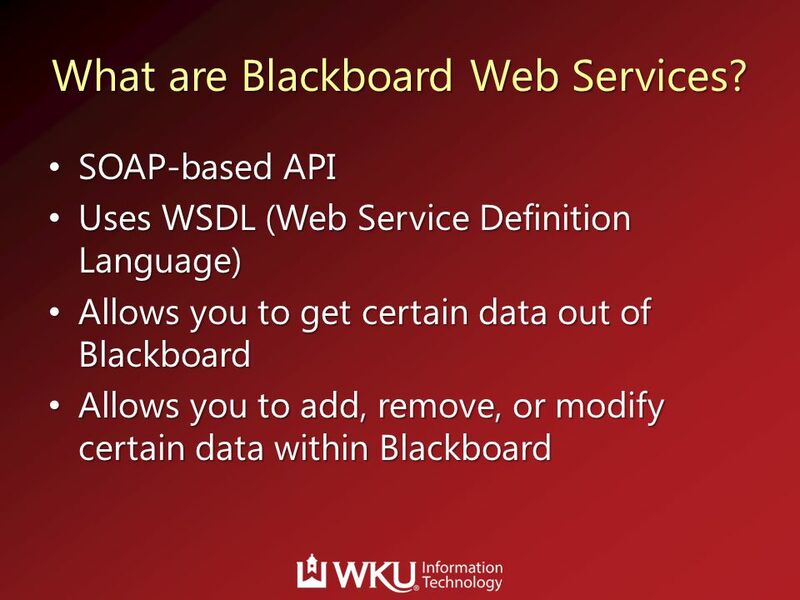 4 What are Blackboard Web Services? 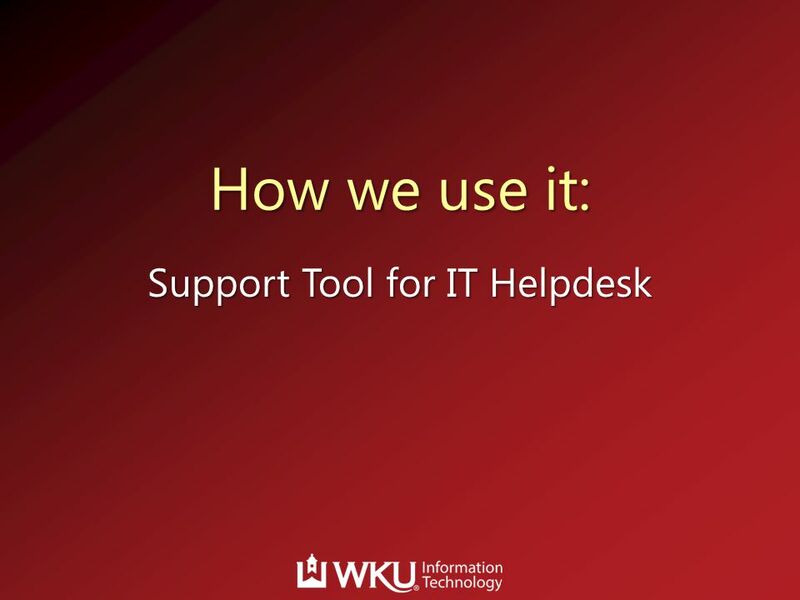 Similar to GitHub GIT - revision control system Allows you track changes made to your code, share it with others, and collaborate on coding projects. 17 What’s behind the button? 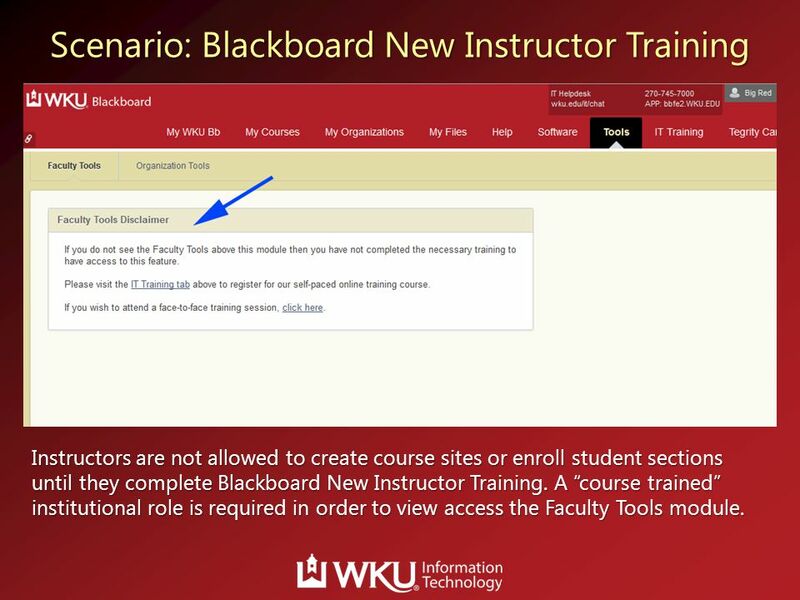 Instructors are not allowed to create course sites or enroll student sections until they complete Blackboard New Instructor Training. 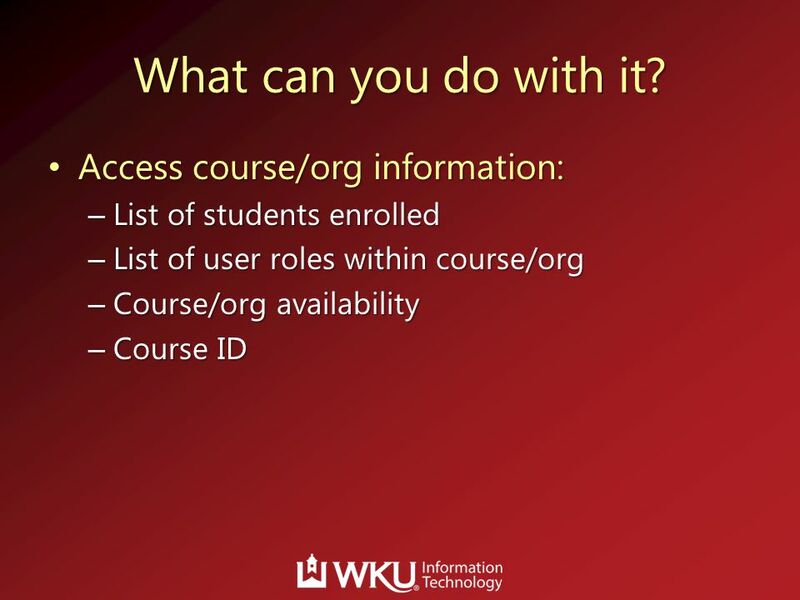 A “course trained” institutional role is required in order to view access the Faculty Tools module. 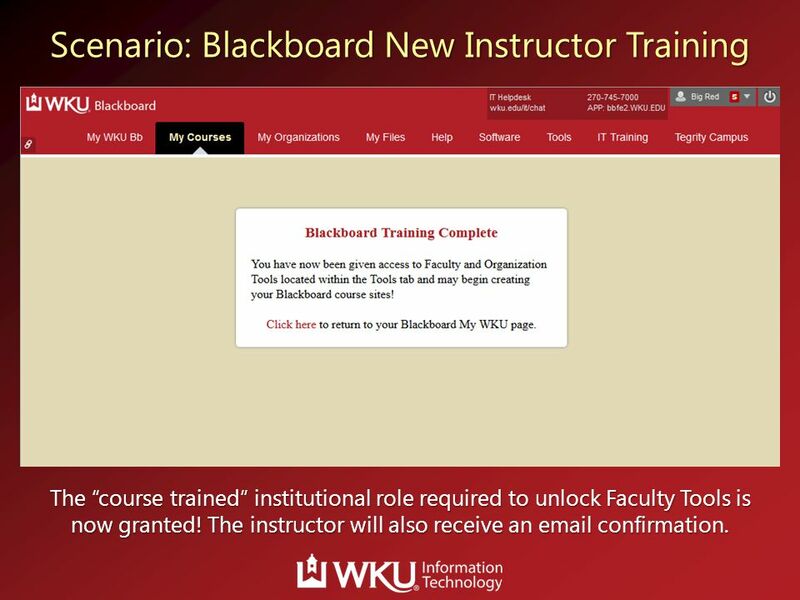 The “course trained” institutional role required to unlock Faculty Tools is now granted! 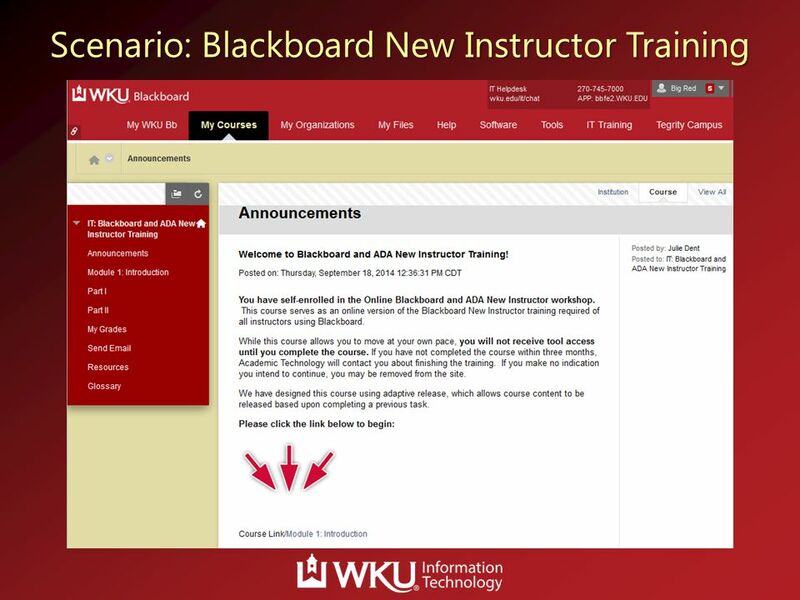 The instructor will also receive an confirmation. 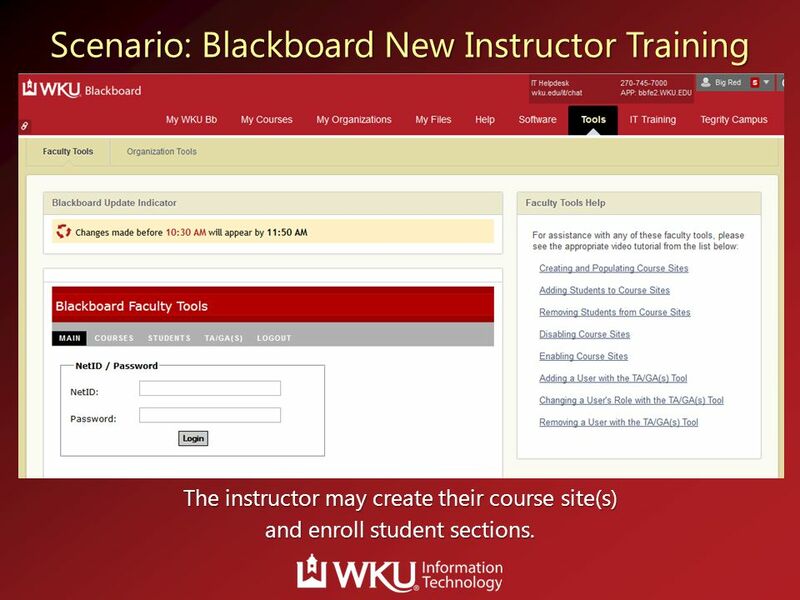 The instructor may create their course site(s) and enroll student sections. 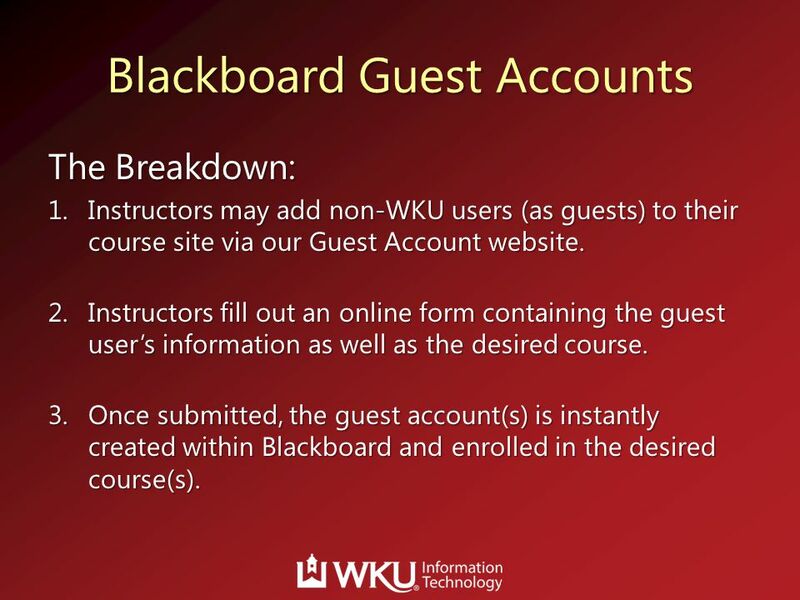 The Breakdown: Instructors may add non-WKU users (as guests) to their course site via our Guest Account website. 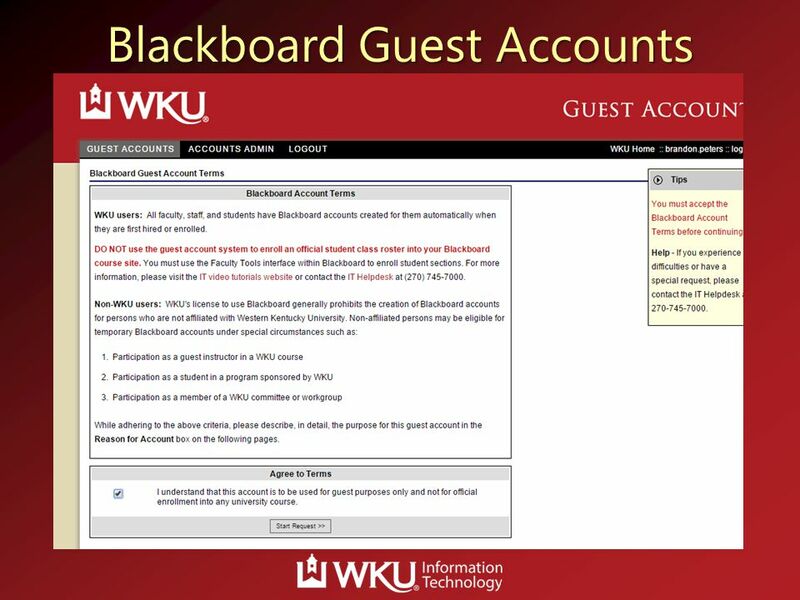 Instructors fill out an online form containing the guest user’s information as well as the desired course. 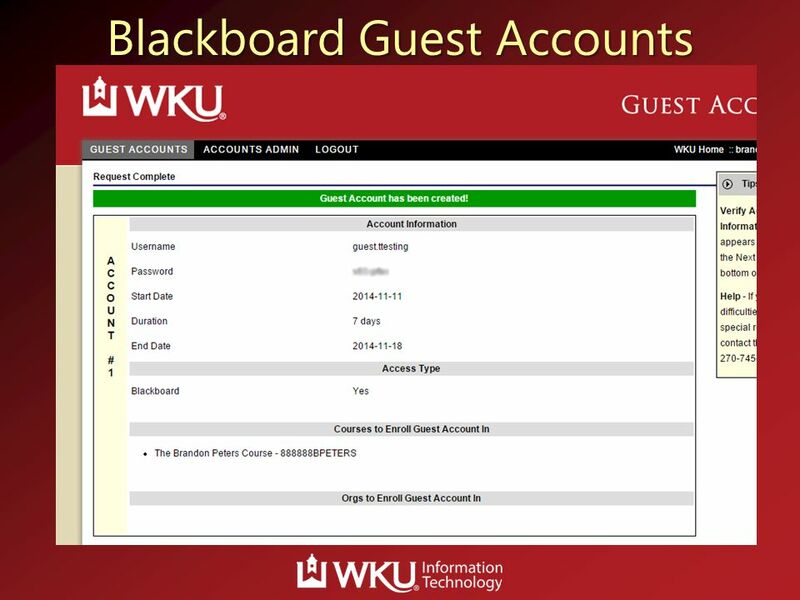 Once submitted, the guest account(s) is instantly created within Blackboard and enrolled in the desired course(s). 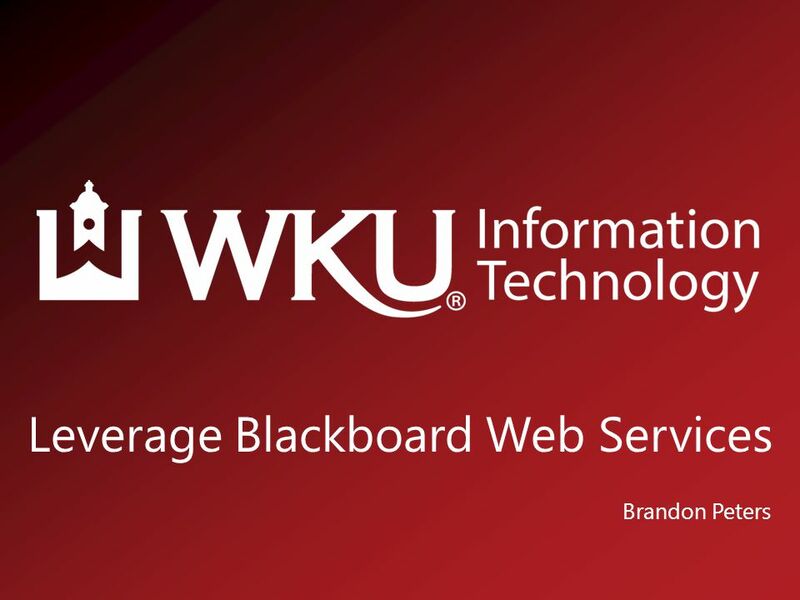 Download ppt "Leverage Blackboard Web Services"
SOIN Administrators New School Year Review Marking Period Setup Event and Holiday setup Website Content check: add photo galleries and newsletters Staff. 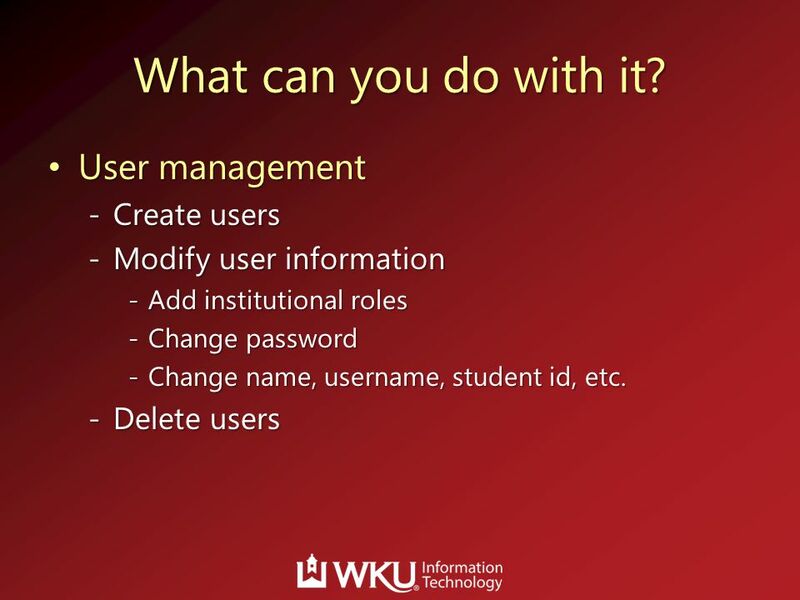 Different Approaches to Single-Sign-On Jeff Kahn, Verbena Consulting. 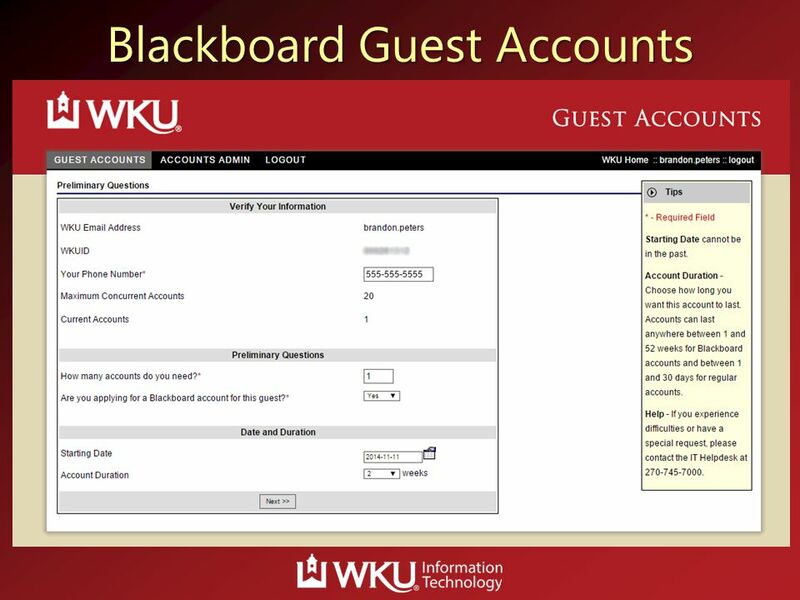 Distance Learning Training October 16, 2009 a.k.a. Melinda and Shelley Take Distance on the Road! 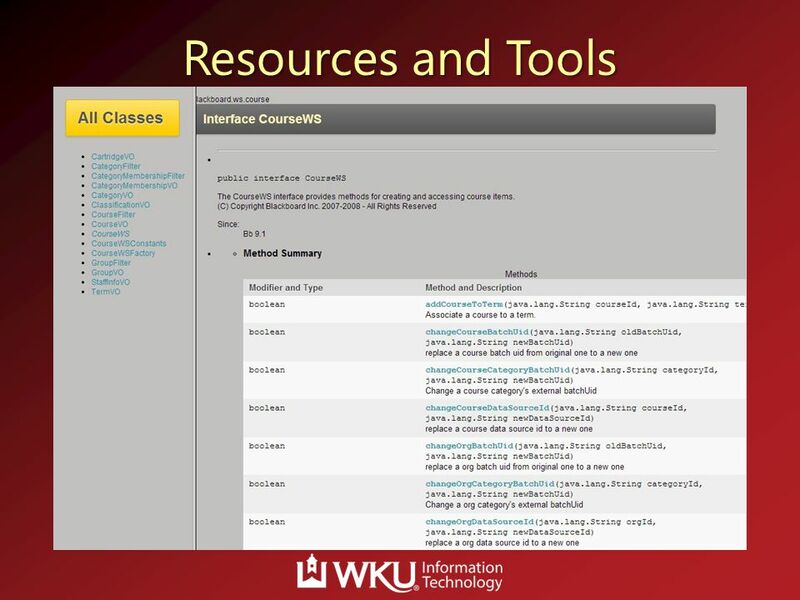 HippoCampus A Free Educational Resource for Teachers. 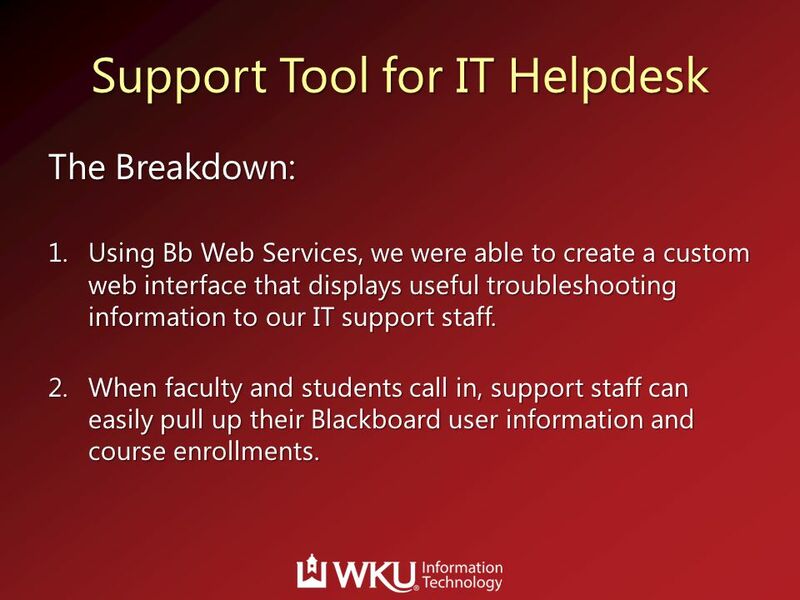 Employee Self-Service (ESS). 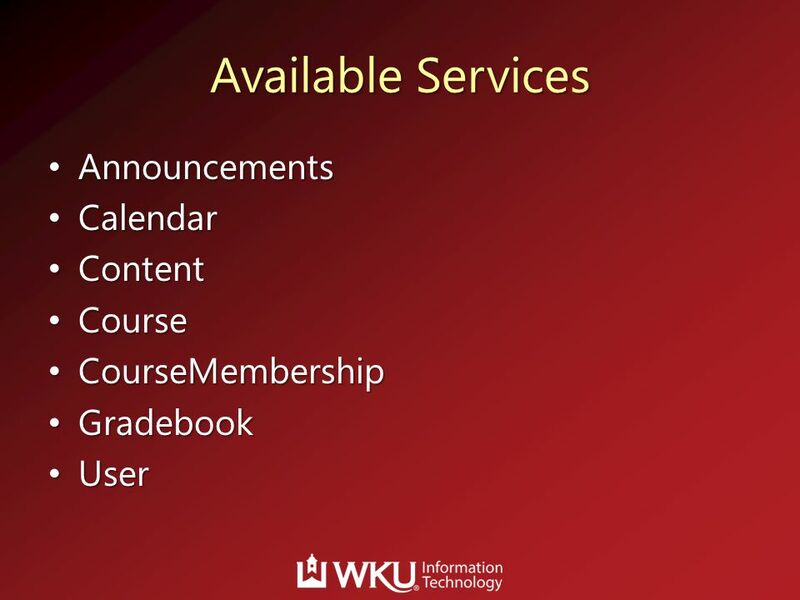 Agenda Introduction 1 Terminology 2 Employee Self-Service Components 3 More Information 4 Questions & Answers 5. 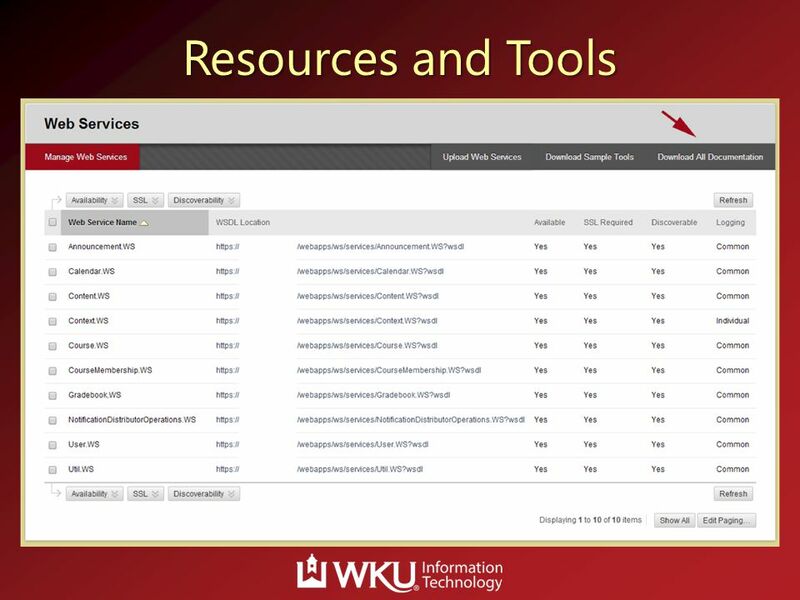 Eric J. Oszakiewski MCTS: SharePoint Application Development SharePoint Configuration. 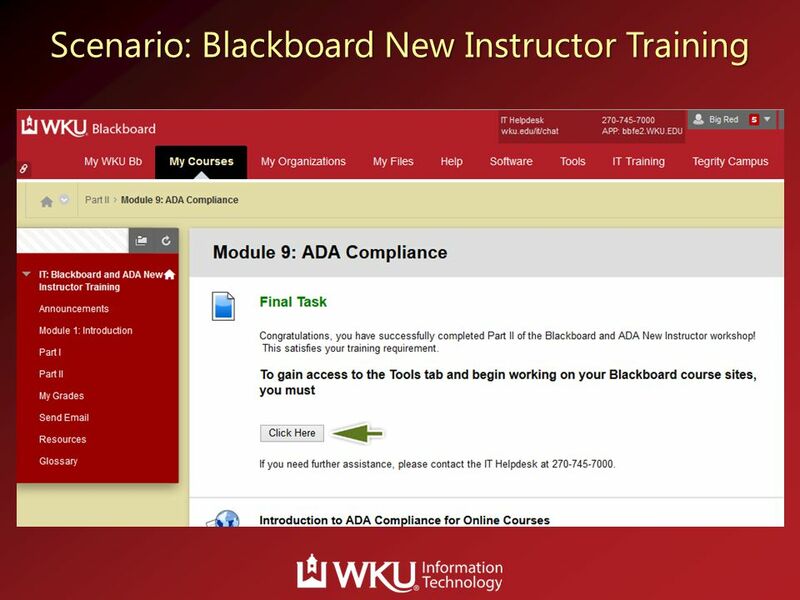 Massachusetts Centralized Clinical Placement System© Clinical Faculty Introduction to the Online Orientation Massachusetts Department of Education A Presentation. 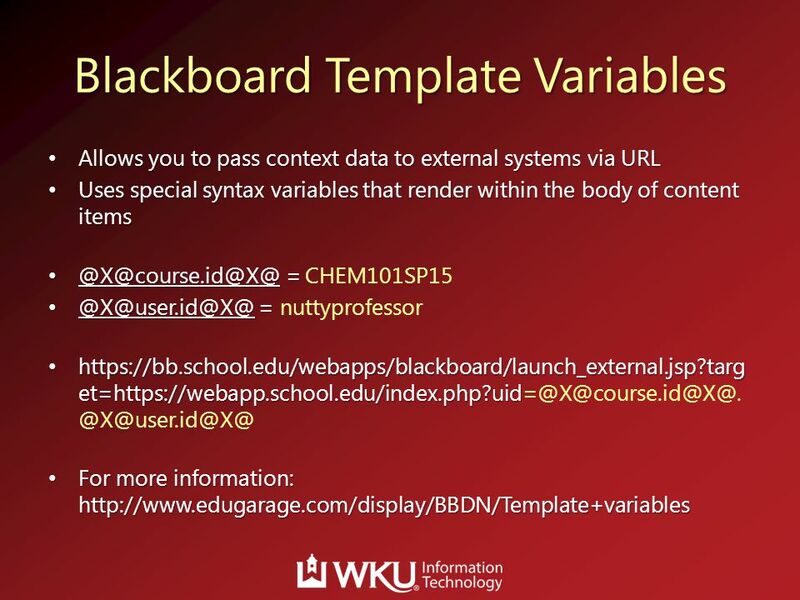 Blackboard Hands-On Lab Session Karl R. Wurst Computer Science Department Daron Barnard Biology Department Center for Teaching and Learning Worcester State. 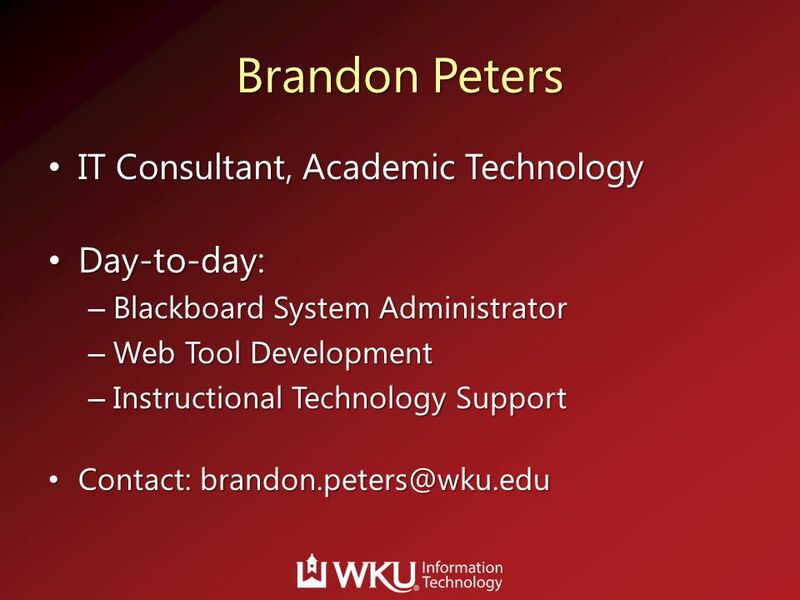 Getting Started in PT CPI Web A Student Overview Presentation by Academic Software Plus. 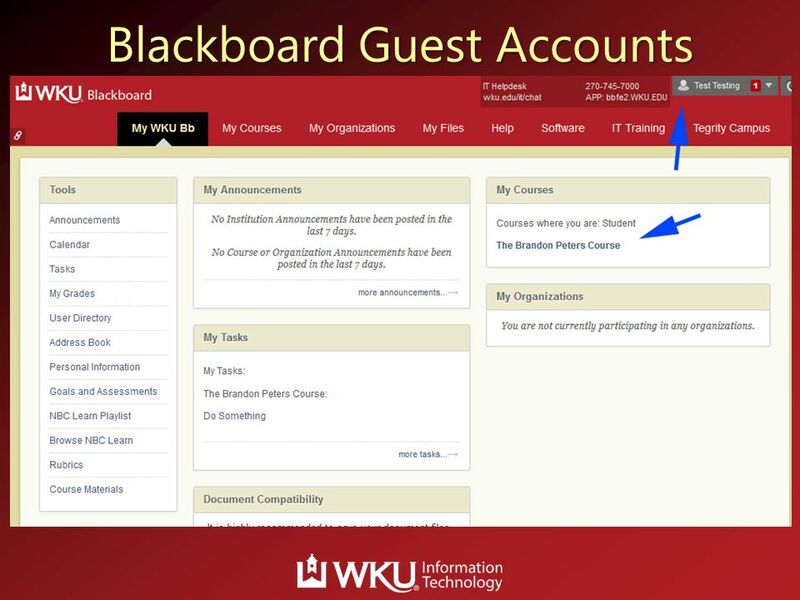 Introduction to: Bb Course Control Panel Enter name VLE training. 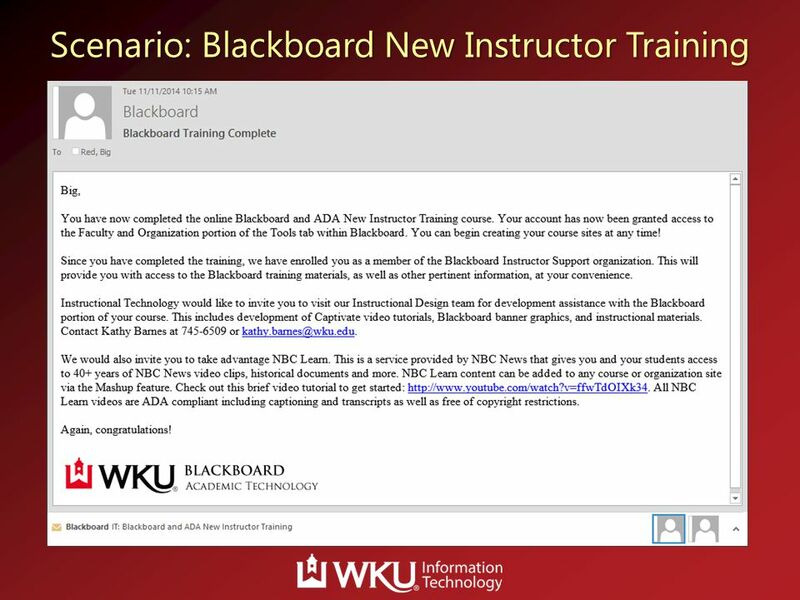 NC Testing Program Online Training Kay Campany Science Instructional Facilitator Please log into your. 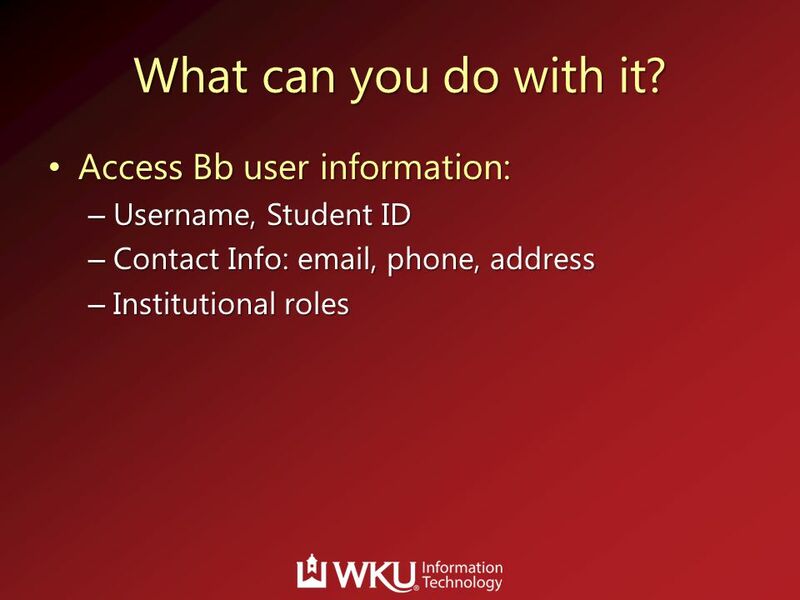 u.tk20.com. 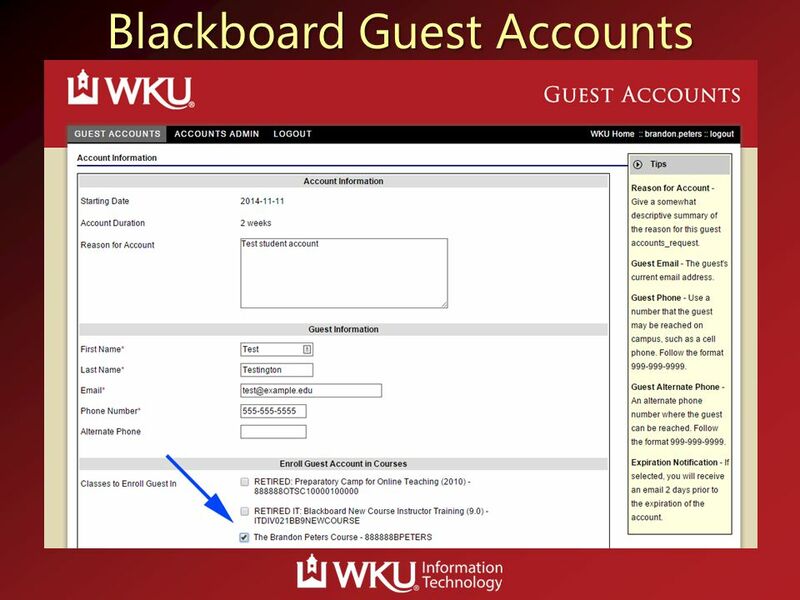 Brief Overview of TK20 Navigating TK20 (Hands On Practice) –Student Tasks –Instructor Tasks Logging into the Real System Questions. 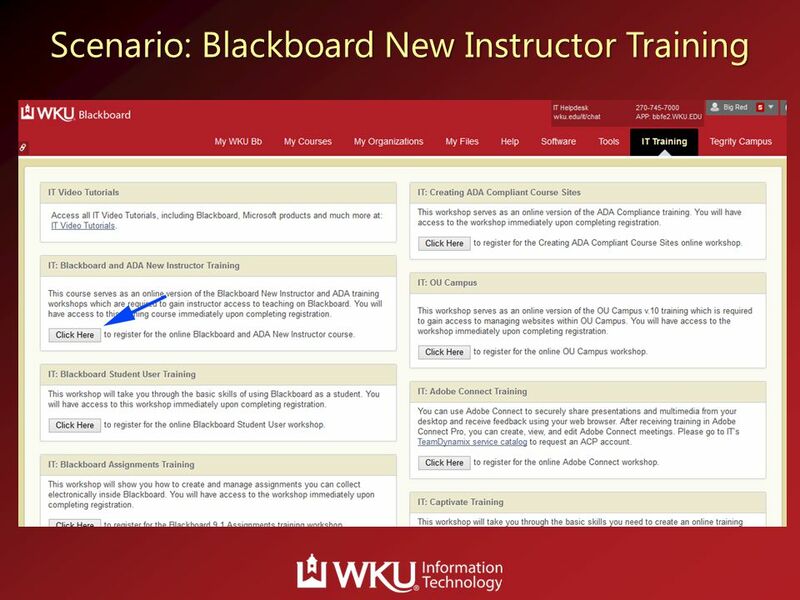 ON-LINE CONSORTIUM MEETING AUGUST 14, 2012 STEERING COMMITTEE UPDATE Blackboard.